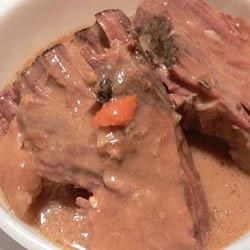 Your family will enjoy the crock pot venison roast recipe. We love it so much that we have it at least once a week in the winter. You may also use elk or moose instead of venison. Try my venison roast rub below. Spray a large crock pot with vegetable oil. Add the cream soup, onion soup mix, beef broth, garlic powder, onion powder and parsley together; whisking until smooth. Season to taste with salt and pepper. Fold in the mushrooms. Place the venison roast into the crock pot and spoon some of the mixture over the roast. Cover and cook on high for 5 hours (8 hours on low). If the roast is frozen, cook on high for 8 to 10 hours; or until meat falls apart. Serve over buttered noodles, cooked rice, mashed potatoes or bread slices. 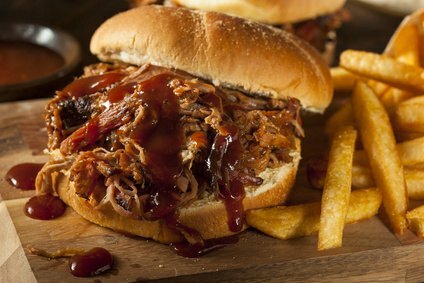 If you don't have a slow cooker, just bake the roast at 275 degrees for 4 to 5 hours or until tender. Here's a recipe to rub on the roast that makes it so flavorful. Don't worry about all the salt - that's what gives it a beautiful taste. Mix ingredients together. This makes 1/4 cup. Rub it on a beef roast (or any kind of roast for that matter), and bake it. For marinade, slice and peel the onion and carrots, then simmer gently in olive oil - but do not brown. Put into a glass bowl (not metal), and add wine and the balance of the marinade ingredients. Marinate the venison for 2 days, turning several times a day so that all surfaces are coated with marinade. Remove from the marinade and dry roast with paper towels. Combine butter and olive oil in a large heavy skillet with a lid and when hot add the diced bacon. Fry until crisp. Add the venison and brown on all sides; remove from skillet and place in a roasting pan. Continue to simmer marinade until reduced to half the amount. Strain and pour over venison. Season with salt and pepper to taste. Bake at 325 degrees, covered, 30 minutes per pound (5 lb x 30 = 150 minutes or 2-1/2 hours). For sauce, strain juice from pan and simmer on stove top until reduced by half. Mix butter with the flour and add to the sauce to thicken. Stir well and add wine and jelly, mixing well. Serve. Venison is so delicious with served with cranberry or blueberry sauce. Try it, you will love it. This is comfort food at it's best. 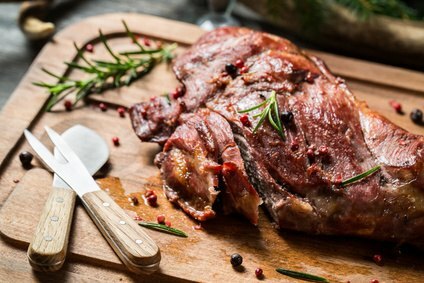 This venison roast recipe is delicious. Serve with bread and a salad. In a large dutch oven, heat the bacon drippings or oil and brown the roast on all sides. Add the sliced onion and garlic and saute to light brown in color. Add the beef broth and bay leaves. Cover and cook on low heat for 1 hour. Add vinegar and brown sugar. Continue to cook over low heat for 1 more hour. Add salt, pepper, ketchup and raisins. Cook over low heat for 30 minutes or until tender. Serve on a platter with buttered noodles. Pour sauce from roast over noodles. Season roast with salt and pepper to taste. Brown roast in bacon drippings along with the minced garlic in a oven proof pan or cast iron skillet. Drain fat and add the water. Bring to a boil and transfer to a 350 degree oven. Bake for 3 hours or until tender. Remove meat from skillet and add the remaining ingredients to the juices. Return to oven and bake 1 more hour or until thickened. 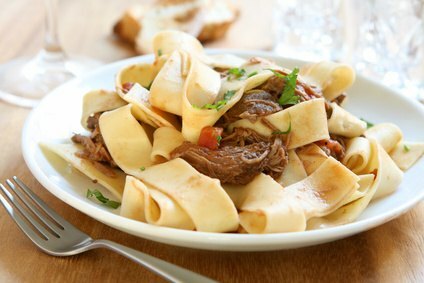 Slice roast thinly or shred with two forks. Add the meat to the sauce and bake for 30 minutes. Serve on buns with french fries. Another one of my awesome Venison roast recipes. It's is so easy to prepare and delicious. 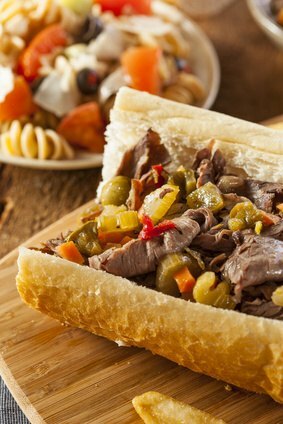 My secret to the Best Italian Beef Sandwich recipe is my homemade Italian dressing mix; recipe below. You may use elk, moose or caribou also. You will need to fill your crock pot 1/2 full of water (this is for the broth) and add 1 heaping tablespoon of the Better Than Bouillon Beef Base to the water. Mix well and taste it. If it is watered down, add some more of the beef base. Add the entire jar of peppers to the broth and give it a quick stir or two. Carefully add the venison roast and finally measure out two servings of the homemade Italian Salad Dressing mix and sprinkle over the roast and in the broth. Cook on high for 6-8 hours or until the roast is falling apart. I place the roast on a platter and shred it with a fork and put back in the broth. Toast the buns if you wish in the oven and dunk the bottom half of the top bun in the broth. Fill with the shredded meat, add the sauteed peppers and onion and top with cheese. Place under a broiler until the cheese is melted. Is your mouth watering now? It should be. Mix ingredients together and store in a tightly closed container in a cool and dry place. Shake well and chill the night before you use it.